This Jaguar F-PACE has a powerful Intercooled Turbo Diesel I-4 2.0 L/122 engine powering this Automatic transmission. VISION PACK -inc: Blind Spot Monitor & Reverse Traffic Detection, Autonomous Emergency Braking, Lane Departure Warning, Adaptive LED Headlights w/Signature DRL, automatic high beam assist (AHBA), TECHNOLOGY PACK -inc: InControl Touch Pro Navigation System, solid state drive (SSD), real time traffic, single CD/DVD player, 60GB solid state drive (10GB user media storage), additional USB socket (replaces AUX in) in central cubby box ICP, JaguarVoice and low traction surface launch, InControl PRO SERVICES, connected navigation w/real time traffic, route planner app, arrival mode, destination sharing, street and satellite views, fuel prices, live services: news, finance, sports, Google send to car, weather, flight tracker and voice dictation (excludes navigation), Connected navigation active for warranty period, Renewal required thereafter, Radio: Meridian 825W Digital Surround Sound System, 10 touch screen, 16 speakers plus subwoofer, SiriusXM satellite radio, dynamic volume control and Bluetooth telephone connectivity and streaming, InControl WiFi, 3G WiFi hotspot, SIM card supplied w/vehicle and includes trial data plan, 12.3 Full Digital Instrument Panel, SANTORINI BLACK METALLIC. * Drive Your Jaguar F-PACE Prestige in Luxury with These Packages*LATTE, PERFORATED GRAINED LEATHER SEAT TRIM -inc: contrast stitching, LATTE, GRAINED LEATHER SEAT TRIM -inc: contrast stitching, HEATED WINDSCREEN -inc: heated washer jets, HEAD-UP DISPLAY, FULL LENGTH GLOSS BLACK ROOF RAILS, ACTIVITY KEY, Wheels: 19 7 Split-Spoke (Style 7012), Voice Recorder, Valet Function, Trunk/Hatch Auto-Latch, Trip Computer, Transmission: 8-Speed Automatic, Transmission w/Driver Selectable Mode and Jaguar Sequential Shift Sequential Shift Control w/Steering Wheel Controls, Towing w/Trailer Sway Control, Tires: P255/55R19 M+S All-Season. * Visit Us Today *Treat yourself- stop by Jaguar Land Rover Lakeridge located at 280 Achilles Rd, Ajax, ON L1S 7S3 to make this car yours today!This Jaguar F-PACE has a strong Intercooled Turbo Diesel I-4 2.0 L/122 engine powering this Automatic transmission. VISION PACK -inc: Blind Spot Monitor & Reverse Traffic Detection, Autonomous Emergency Braking, Lane Departure Warning, Adaptive LED Headlights w/Signature DRL, automatic high beam assist (AHBA), TECHNOLOGY PACK -inc: InControl Touch Pro Navigation System, solid state drive (SSD), real time traffic, single CD/DVD player, 60GB solid state drive (10GB user media storage), additional USB socket (replaces AUX in) in central cubby box ICP, JaguarVoice and low traction surface launch, InControl PRO SERVICES, connected navigation w/real time traffic, route planner app, arrival mode, destination sharing, street and satellite views, fuel prices, live services: news, finance, sports, Google send to car, weather, flight tracker and voice dictation (excludes navigation), Connected navigation active for warranty period, Renewal required thereafter, Radio: Meridian 825W Digital Surround Sound System, 10 touch screen, 16 speakers plus subwoofer, SiriusXM satellite radio, dynamic volume control and Bluetooth telephone connectivity and streaming, InControl WiFi, 3G WiFi hotspot, SIM card supplied w/vehicle and includes trial data plan, 12.3 Full Digital Instrument Panel, SANTORINI BLACK METALLIC. * Drive Your Jaguar F-PACE Prestige in Luxury with These Packages*LATTE, PERFORATED GRAINED LEATHER SEAT TRIM -inc: contrast stitching, LATTE, GRAINED LEATHER SEAT TRIM -inc: contrast stitching, HEATED WINDSCREEN -inc: heated washer jets, HEAD-UP DISPLAY, FULL LENGTH GLOSS BLACK ROOF RAILS, ACTIVITY KEY, Wheels: 19 7 Split-Spoke (Style 7012), Voice Recorder, Valet Function, Trunk/Hatch Auto-Latch, Trip Computer, Transmission: 8-Speed Automatic, Transmission w/Driver Selectable Mode and Jaguar Sequential Shift Sequential Shift Control w/Steering Wheel Controls, Towing w/Trailer Sway Control, Tires: P255/55R19 M+S All-Season. 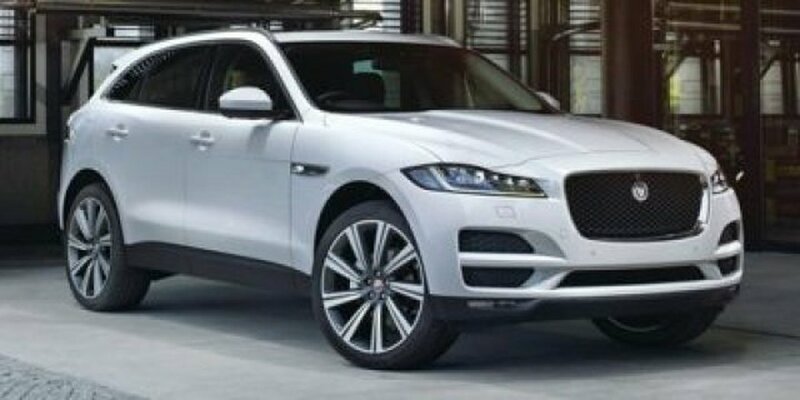 * Visit Us Today *A short visit to Jaguar Land Rover Lakeridge located at 280 Achilles Rd, Ajax, ON L1S 7S3 can get you a dependable F-PACE today!Prices include all fees except licensing and HST.